Full Day – 9 a.m. to 3:41 p.m. 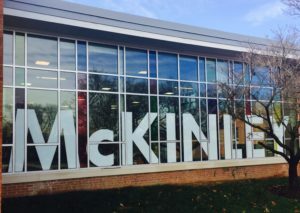 Early Release – 9 a.m. to 1:26 p.m.
McKinley School is a neighborhood school where staff, families and members of the community work collaboratively to provide a rich educational experience for its students. The school’s focused approach to instruction, which incorporates a variety of strategies supported by research, has produced highly successful learners. The staff strives to provide each student a nurturing yet challenging experience that stimulates intellectual curiosity, encourages critical and creative thinking, and culminates in academic achievement. McKinley students learn Spanish through the APS Foreign Language Elementary School Program. Other initiatives include the Children’s Theater, an extensive offering of after-school enrichment courses, a highly acclaimed science fair, and an exemplary project – Kaleidoscope – that focuses on integrating the arts throughout the curriculum.